The high temperature for the day comes in the afternoon and the low in the wee hours of the morning, right? You can probably guess that with such a leading question and the fact that we are talking about Alaska (where “we don’t care how they do it in the Lower 48”) means I am about to try to blow this assumption out of the water. A look at November 25 on the above graph (click on graph for larger version) seems to support the daytime high pattern mentioned in the opening sentence. However, notice how the temperature rise started before sunrise and started to fall well before sunset. On the 26th the temperature rises from midnight to sunrise, falls during the short daylight hours and rises again after sunset. Assumption blasted. The physical principles that govern daily temperatures apply anywhere. But in Alaska some of these principles are often more pronounced, and others less. The term diurnal, by the way, is applied in meteorology to things that have some sort of a daily pattern or cycle. The pattern of daily temperature changes mentioned in the lead-in is caused by the sun, and is the true diurnal temperature cycle. Of course at this time of the year in Alaska the sun is pretty much AWOL, which means all the other factors which control the temperature have little trouble overpowering its influence. These include the advection (the moving in on the wind) of warmer or colder air from another area, mixing of warmer (usually) or colder air from layers above the surface, and radiational effects. Radiation is what the sun is all about, and nothing beats it at this game when it is around. When the sun is down, the earth mostly loses heat through radiation, bringing on the cool half of the classic diurnal cycle. During the Alaska winter we have the radiational heat loss part down well and that is basically why it is so cold in the polar regions. But there is another source of warming radiation in the northern winter…clouds. Yes, clouds. And they don’t simply stop nighttime heat loss as is commonly known (the blanket effect). They do actually radiate heat down to the surface. (Everything radiates infrared heat…and receives radiation from other things. It is when the radiational balance between masses is lopsided that strong warming or cooling takes place.) The clouds simply need to be in a warmer stratum of air than the surface. This is almost always the case in the interior and north and west coast winter, much less so in south coastal areas. 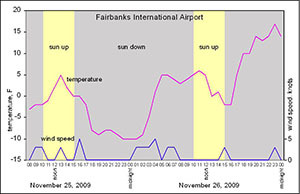 In the Fairbanks example, it is the mixing effect of the wind that is the most pronounced. Even the very slight wind of 3-5 knots (4-6 mph) is enough to stir some warmer air down to the surface in the otherwise calm air, causing a temperature jump. The cloud cover (column labeled sky conditions in the hourly text reports below) shows a less convincing correlation with the temperature in this case, although the automatic cloud sensing equipment may not be good enough for this kind of scrutiny. In other cases it can be a dominant factor. Wind can pick up and clouds can move in or out anytime of the day or night, affecting the temperature and causing a fairly large temperature range on the high and low record for the day, but it is not a true diurnal cycle. 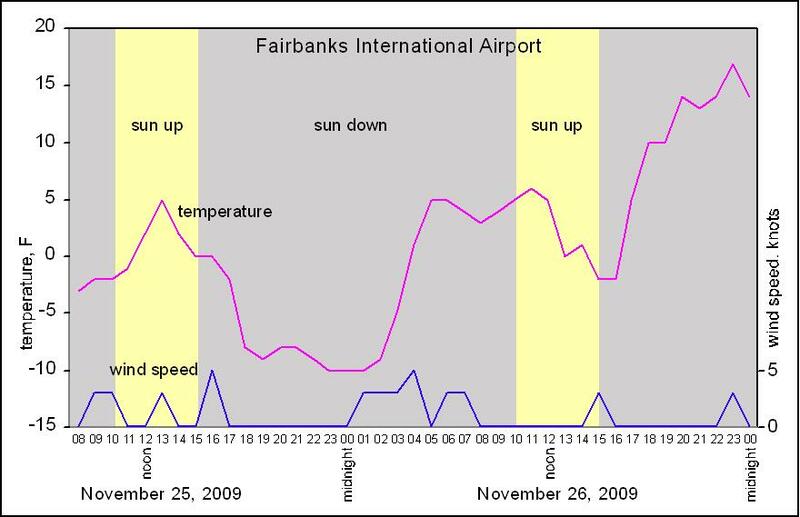 Here are the hourly observations from Fairbanks covering roughly the same time as the graph above. The time column is in Alaska Standard Time. Temperature (labeled temp) is shown in Fahrenheit. The wind column gives the direction in the first 3 digits and speed in the last two (in knots).